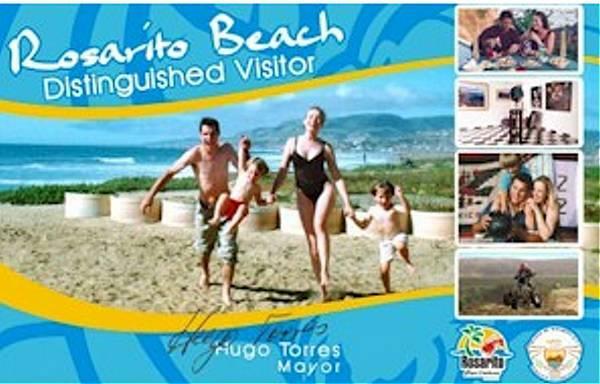 New Mayor Hugo Torres in his on-going campaign to improve the community and make it more desirable for tourists, along with the Rosarito Beach Convention & Visitors Bureau, have implemented a new program: the city's first Distinguished Visitor Card. The VIP card that will identify the cardholder and entitle them to special discounts on everything from hotels and dining to shopping at many of the local galleries, craft, leather, pottery, perfume and other merchants in the area who have chosen to participate. "We wanted to provide visitors who frequent Rosarito Beach something to let them know how special they are to us and how much we appreciate them coming here," said Mayor Torres. In addition to providing discounts, the card also contains helpful information such as phone numbers and web links for Tourist Assistance plus other useful information when visiting Rosarito Beach. The Distinguished Visitor Card will be free to those who desire one and can be easily obtained at the Rosarito Beach Convention & Visitors Bureau, at participating merchants or by going to the website http://www.rosarito.org/vip and filling out a form. The card will be mailed to the applicant's home or place of business. The website contains a list of all of the participating merchants and will be updated as more merchants are added to the program. The card is honored wherever the city of Rosarito Beach logo is displayed. The VIP card comes just in time for the summer season. The city is gearing up to implement the program which has not only received endorsement from the entire city government and mayor's office but also the Baja California State Tourism Board. This program is all part of the "new Rosarito" that Mayor Torres promised. "It is simply an extension of our Mexican culture, the 'Mi casa, su casa' mentality that promotes Old World hospitality and charm and makes Baja and especially Rosarito Beach a very special place to vacation and visit," said Mayor Torres. More than 200 requests were received for the VIP card in the first few days of being available. For more information on the Rosarito Beach Distinguished Visitor Card, go to http://www.rosarito.org/vip.